"O Radha! O beloved of Madhava! O You who are worshiped by all the young girls of Gokula! All glories unto You! All glories unto You! "0 You who dress Yourself in such a way as to increase Lord Damodara's love and attachment for You! 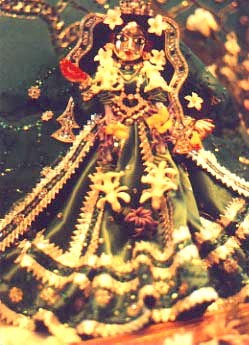 O queen of Vrndavana, which is the pleasure grove of Lord Hari! O new moon who has arisen from the ocean of King Vrsabhanu! O friend of Lalita! O You who make Visakha loyal to You due to Your wonderful qualities of friendliness, kindness, and faithfulness to Krsna! O You who are filled with compassion! O You whose divine characteristics are described by the great sages Sanaka and Sanatana! O Radha, please be merciful to me!"